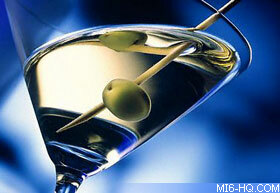 007 has a refined repertoire when it comes to selecting his preferred poisons. Everyone knows the about his favourite "Martini, shaken not stirred", but how many people have sampled one, let alone know how to make one? "Bond, James Bond" started Sean Connery's silver screen presence as 007, but the character is perhaps more well known around the world for his favourite aperitif, the now infamous "Vodka Martini, shaken not stirred". Although you will never hear Roger Moore utter the line in any of his 7 films, the legend returned with Timothy Dalton and Pierce Brosnan. When the timeline was rebooted for "Casino Royale" Bond doesn't "give a damn" how his martini is served. Yet, as his pallet refines he quickly becomes the fussy drinker Bond fans are familiar with. The best cocktail-makers use a lot of ice. The glasses are iced to cool (sometimes even with a small amount of soda water) and any olive garnish is usually buried in the ice before and during the mixing process. Be liberal with the ice you use in the shaker, even if you will drain or filter it later. Thus, before beginning, assure you have several trays of ice at the ready. For the martini, a champagne goblet was Ian Fleming's choice for service, but a martini glass (pictured below) is equally serviceable. Simple syrup is fine white sugar heated with a little water to make a sweet, dissolvable syrup. It takes patience and care to make, but it can be purchased too. For best results with the Mint Julep, invest in a wooden pestle known as a muddler. A collins glass is often called a highball, it is tall, with a rounded base and straight sides. Enjoy! Add all ingredients standard cocktail shaker over plenty of ice, shake until the drink is ice cold. Serve in a pre-iced champagne goblet. 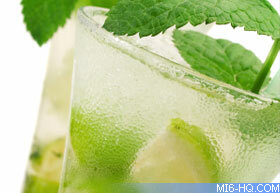 Add the mint to a highball glass, poor in the rum, lime and sugar. Mix with a barspoon to release the mint aroma. Add crushed ice and stir. Top up with soda water as required. 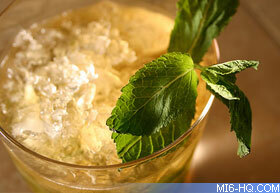 Crush the mint and sugar together in the bottom of a Collins glass. Fill the glass with ice and poor in the bourbon. Sir and serve. Add the rum, lime juice, sugar to an iced martini shaker. Shake until icy cold. Strain the mixture into a collins glass. Top up with soda. Deaver's own cocktail recipe is unclear on whether this should be shaken or stirred. 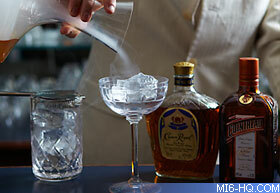 The MI6 experts suggest building over ice and stirring briefly before serving. 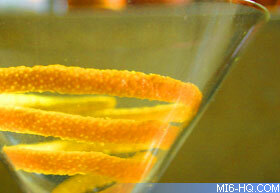 A garnish of orange peel could complete the look.